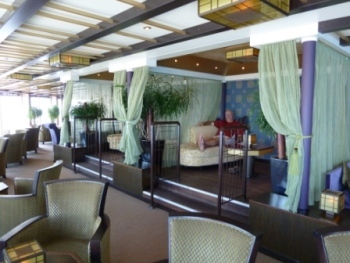 The Eurodam is one of only two HAL ships that has an Asian inspired lounge and restaurant. We loved the quiet atmosphere of the Silk Den outside of the Tamarind Restaurant. 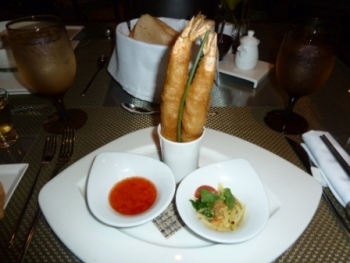 Everything was beautifully presented, like this Shrimp Tempura served with a Green Papaya Salad and Garlic Chili Sauce. 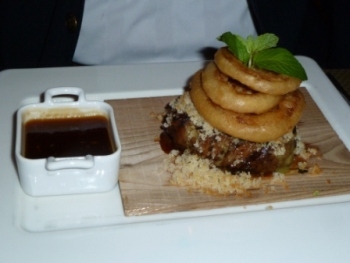 One entree was the Wasabi and Soy Crusted Beef Tenderloin served on an oak plant with tempura onion rings. 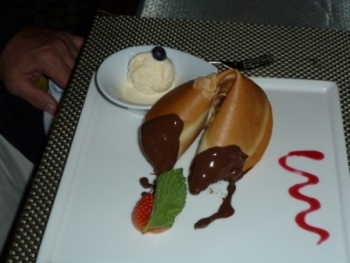 For dessert a huge Chocolate Almond Tuile Fortune Cookie filled with chocolate ganache.